Definition: An Intrapreneurship is the system wherein the principles of entrepreneurship are practiced within the boundaries of the firm. An intrapreneur is a person who takes on the responsibility to innovate new ideas, products and processes or any new invention within the organization. An intrapreneur is the individual who thinks out of the box and possesses the leadership skills and does not fear from risk. Thus, an intrapreneur possesses the same traits as that of an entrepreneur. 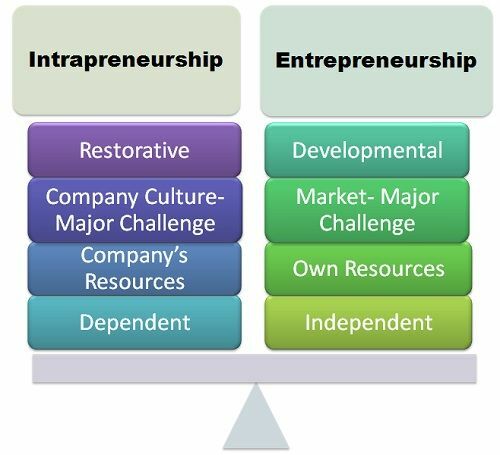 Intrapreneurship is restorative in nature, i.e. an organization encourages the employees to practice the entrepreneurial principles to counter stagnation within the firm or transform the slow growth of the company into a high-growth. Whereas the entrepreneurship is developmental in nature, i.e. an individual creates something that has never existed before, such as a new product, process or a new venture itself. In intrapreneurship, the major challenge that individual faces are from the company’s culture itself. Sometimes, the corporate relationships and the mindsets of employees acts as a hurdle in the path of an intrapreneur. Whereas, in the case of entrepreneurship, the market is the only enemy. An entrepreneur has to scrutinize the market conditions thoroughly to cross the hurdles coming in his way. An intrapreneur has an access to firm’s resources such as funds, manufacturing setups, marketing facilities, and other supporting activities to give shape to his dreams. Whereas an entrepreneur has to arrange his own resources such as own funds or the borrowed funds, manufacturing facilities, marketing facilities, etc. An intrapreneur does not have the ownership of a new venture and is not even independent to take decisions, whereas an entrepreneur is the whole sole owner of the new venture established by him. Also, he is independent to take any decisions with respect to his setup. Thus, an Intrapreneurship is a practice of creating the entrepreneurial environment within the organization, thereby enabling the employees to apply their entrepreneurial skills in the job roles; they are assigned to.